Journey back in time through stunning hill country farms and native bush. Hear stories of the rail workers, as you travel the Forgotten World aboard a self driven Rail Cart. This 3.5 hour return journey includes a stop with delicious home baking and drinks at the historical village of Matiere. 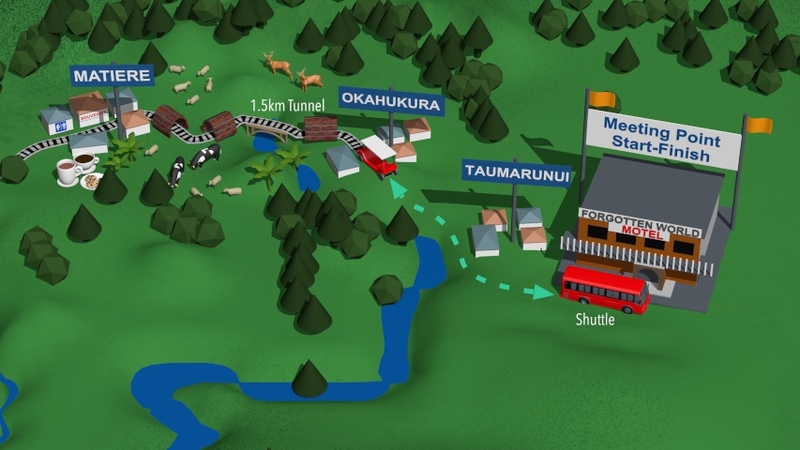 After checking in at the Forgotten World Motel, Taumarunui, we will shuttle you out to your waiting railcart at Okahukura. Set off down the line along 16km of the Forgotten World Railway. 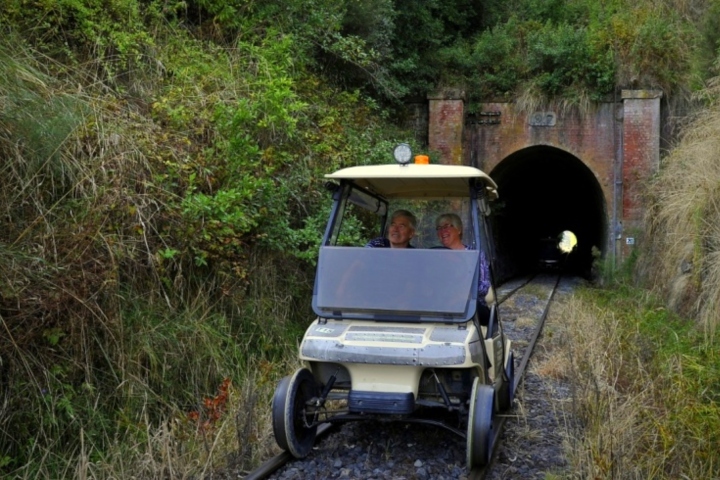 Travel through 5 tunnels, including the longest tunnel (1.5km), and marvel at the beautiful handbuilt brick tunnels. Enjoy cruising through stunning hill country farms and native bush. A drink and some lovely home baking will be waiting your arrival at Matiere, the turnaround point. On your return journey you'll get to experience the ride from a whole new perspective. Switch drivers, take photos and enjoy the stunning scenery on your return journey to Okahukura. Board the shuttle to return to the Forgotten World Motel. The RailCarts have waterproof containers on the back of each cart that are ideal for holding personal day bags and extra coats. Please find a list of things you may want to bring with you just below. For more information click here. Rainproof coat if rain is forecast. Stratford - Vehicles may be left at the Eastern Taranaki Experience depot in an unsecured area. A shuttle will then transport you from there to the start of your tour. For those experiencing The Ultimate, the shuttle is included within the cost of your tour. For those experiencing the Republic Rail Picnic and prefer to leave vehicles in Stratford and take a shuttle to Douglas, then a fee of $15 per head is payable to the shuttle driver. There is off road unsecured parking at Douglas close to the line where The Republic Picnic tour departs at no charge. We cannot allow alcohol to be consumed whilst on the line itself. Anyone in control of a railcart must not be under the influence of alcohol or drugs. Not on our railway line. No-one is too young or too old! However in our jet boat children must be 3 years of age or over. To ensure their safety, children travelling on the RailCarts must bring their car appropriate car-seat for use in the cart, and must remain strapped in any time the cart is moving. All children must be fully supervised by an adult at all times. We offer family discounts on four of our tours. 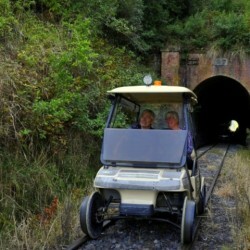 The 5 Tunnel Railcart tour and jetboat tours; the Lavender Run, The Hatrick and the Bridge to Nowhere. Please note though, that we cannot have children under 3 in our jet boat. As we are travelling through rural countryside with working farms on each side of the railway corridor we cannot allow any pets on the line.